Jeep Wrangler YJ MAnual Temp Gauge install can be necessary when the factory electric gauge goes bad. With the factory electric you can try replacing the sending unit to get factory gauge working again. But, if the gauge cluster goes completely out, you need a solution ASAP. Problem with the Jeep 4 cylinders and 6 cylinders is, the factory sending unit hole is way too small for the temperature prob for aftermarket manual gauges. So whats a Jeeper to do?? You're gonna need a few items to create the adapter for this mod. These items can be sourced at your local hardware store int he plumbing isle. Apply plumbers tape to all the treads and assemble as demonstrated in the video below. Here is an adapter I found on Amazon that will assist in installing a manual gauge if you have time to wait for shipping. Install process will be the same as the assembled DIY adapter explained on the site and shown in the video. Where is this adapter going to be placed? About mid point, cut the heater hose (not radiator hose) coming from the water neck to the heater core. 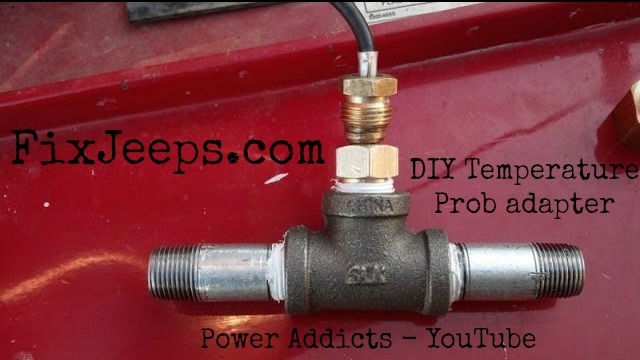 Rejoin the heater hose using the DIY gauge adapter. Tighten the clamps securely. Run the temperature probe from the inside passenger area, through the firewall into the engine bay. Wrap some plumbers tape about the gauge prob threads. Install the temperature probe for the manual gauge into the home made adapter. Tighten securely to ensure the probe doesn't leak. Top off coolant if needed, start the engine to check for leaks.